Thirty-four percent of Coloradans reported that their communities lack outdoor spaces to run, walk or exercise. This barrier varies significantly for Latino respondents (49 percent) and those making less than $25,000 per year (47 percent). Forty-two percent of all Coloradans, 58 percent of Latino and 54 percent of low-income respondents stated that the bike lanes in their communities are insufficient. Access to fresh, healthy food and dangers from crime and traffic are not widespread concerns for all Coloradans but they do disproportionately affect Latino and low-income populations. High or top priority community attributes include: the quality of the environment (87 percent), access to healthy food (79 percent), green space (64 percent) and walkability (58 percent). Findings from the report reveal that Coloradans have a strong desire for communities that support healthy living. At the Foundation, we believe building places that promote healthy living will help us achieve our vision of making Colorado the healthiest state in the nation. 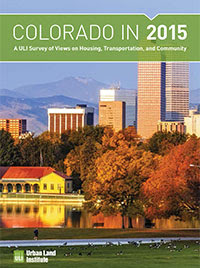 Our partnership with ULI in the development of this survey will better galvanize key groups to drive the movement toward creating the health-centric communities Coloradans desire.View Colorado in 2015 to learn more.